Boeing disclosed that Washington state’s aerospace industry tax incentives saved the company $227 million in 2017. The figures indicate that after subtracting the incentives, Boeing paid about $27 million in B&O tax, the major portion of its state and local tax bill. Boeing disclosed in an annual filing to the state Department of Revenue that Washington state’s aerospace-industry tax incentives saved the company $227 million in 2017, a year in which it shed just over 6,000 jobs in the state. The jetmaker’s tax savings were $15 million less than in 2016. That’s because 2017 revenue at Boeing Commercial Airplanes was down 2 percent from the prior year, primarily due to fewer deliveries of the expensive widebody jets built in Everett. • $96 million from the 40 percent reduction in the Business & Occupation (B&O) tax rate. • $82.5 million from B&O tax credits for activities related to setting up production equipment for the new 777X and the 737 MAX jets. • $34.1 million from B&O tax credits for property excise taxes. Last year’s figure brings Boeing’s total state tax savings over the past four years to just shy of $1 billion. Boeing did not disclose how much tax it actually paid in Washington state in 2017, but a portion of the taxes paid can be deduced. The $96 million tax saving from the 40 percent reduction in the B&O rate implies that Boeing would have been due to pay $240 million without the rate reduction. So after applying the reduction and then subtracting the $117 million in B&O tax credits, Boeing must have paid about $27 million in B&O taxes, by far the largest portion of its total state and local tax bill. Because the regular B&O tax rate is 0.484 percent of total revenue, these figures also imply that Boeing’s 2017 revenue earned in the state was about $49.6 billion. That’s 53 percent of the company’s total 2017 revenue of $93.4 billion, of which $57 billion was from Commercial Airplanes. A separate Boeing filing that accompanies the tax information shows that during 2017 the jet manufacturer cut 6,052 jobs in the state, with total company employment here falling from 71,881 at the end of 2016 to 65,829 a year later. Those job cuts followed just over 7,500 jobs Boeing shed in 2016. That strong tide of job cuts only began to turn this year when Boeing found itself short of labor, especially in Renton, where the company is trying to dig out from under a pile of unfinished 737 jets. Because the company no longer releases monthly employment figures, it isn’t clear how many jobs have been added in 2018. However the International Association of Machinists (IAM) union said this month it’s seen a net gain of 1,200 members so far this year. 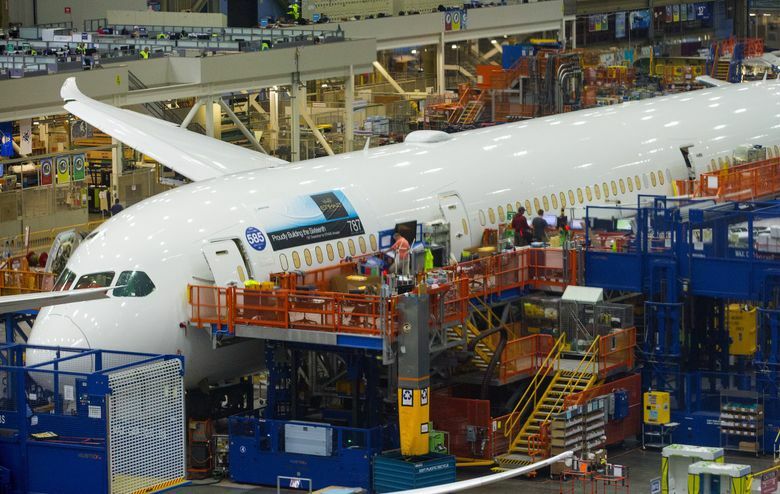 The filing reports that Boeing’s workforce in the state at the end of 2017 included just over 23,000 Machinists, more than 16,000 engineers, more than 6,000 managers and nearly 6,000 business, financial and legal staff. The aerospace tax breaks are a key part of the state’s incentives to retain and expand the industry. They allow Washington to compete for Boeing’s business against other states that can offer upfront money for new projects. Washington’s constitution bars direct payments to private companies. State officials are currently focused on encouraging Boeing to build here its potential next new airplane, the so-called new middle-market airplane (NMA), or 797. To counter any impression that Boeing isn’t pulling its weight locally, based on the low amount of taxes it pays compared to its revenue, Bill McSherry, vice president of Government Operations at Boeing Commercial Airplanes, cited the jetmaker’s outsize contribution to the state’s economy. He said Wednesday that Boeing “continues to invest in our future here in Washington” as the anchor of the state’s aerospace industry. McSherry pointed to the most recent economic analysis of the impact of aerospace locally by consulting firm Community Attributes, which calculated that the industry in 2015 generated more than $21 billion in direct and secondary wages in Washington and had a total economic impact of $95 billion.